The way Ninja warriors move according to Ninjutsu School is one of the most significant aspects in the warrior training since this skill can be evaluated to assess the overall level of the Ninja skills and his availability to demonstrate various movements, sometimes mind-striking in complexity. Sliding over any surfaces while escaping, silent tiptoing, quick position changing on the high-relief terrain – this is not the entire list of skills the Ninja warriors master in shinobi-iri. Hereupon, as against most martial arts, the ninpo studies the wide range of the various ways to struggle and run that are helpful tools for the Ninja in achieving goals. 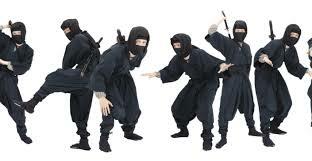 The entire spectrum of Ninja movements can be conditionally classified into two groups of procedures: swiftness and remoteness and quietness. Shinobi-hashiri (Ninja running) is the sprint, the run with clearing the obstacle or marathon. Run and its varieties are widely practiced in Ninja trainings, from specific approaches to general practices. O-ashi stands for the large step. Lung-pu (dragon crawling) – this technique of crawling is used when the Ninja has to watch enemies, shoot from the air gun, drag the captured, and many other cases like the dragon does in nature. The motion is done by hand or foot only which is possible for the highly qualified and trained warrior who mastered all the Ninja techniques of motion. There is a plenty of various techniques to train in motions and everything depends on goals of every specific approach.